First impressions are very important. How true this is! During our first holiday on Achill, in the Summer of 1997, we were ‘smitten’, and just knew we would have to return again to this beautiful Island. We were based at a caravan site near the Golden Strand at Dugort, in the shadow of Slievemore mountain. 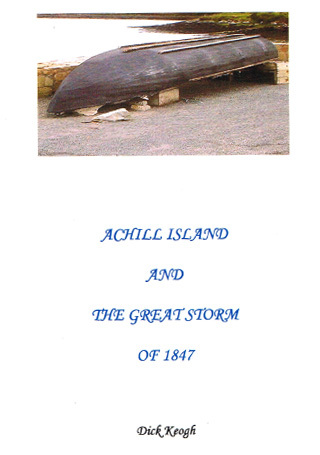 Each day we travelled to some of the many beauty spots and historic sites on Achill. At the southern end of the Island we explored Grainne Uaile’s castle, which was built in the 15th century. As we followed the Atlantic Drive along the rugged coastline we saw some spectacular scenery. We visited the beautiful beaches at Keel and Keem Bay several times. The Achill Missionary Settlement and The Deserted Village were within walking distance of where we were staying in Dugort. During our short holiday we met many of the local people and were greatly encouraged by the warmth of their welcome and their genuine friendship. We returned home to Tipperary determined to revisit Achill again as soon as possible. It was not very long before I was back on the Island. Stephen, a colleague and family friend, accompanied me on this occasion. We came to Achill with the intention of exploring not just the well-advertised tourist attractions, but the whole of the Island. So our tour began early the next morning. Stephen was driving and I was the navigator. Over the next couple of days we travelled the main roads, the minor ones, several winding lanes and Boreens, and even some mountain tracks. When we arrived at the top of Minaun Heights and surveyed the scenery we felt as if we were looking at some of God’s finest creation. We could see vast areas of bogland and moors. Lakes, hills and valleys were spread out before us, with majestic Slievemore in the distance. Beautiful beaches, rugged mountains and sheep grazing peacefully suggested to us that Achill was a haven to which one could come if they wished to escape, even temporarily, from life’s troubles.